Casey Carle on the cover of 'Good Times', A publication of Binghamton's Press & Sun-Bulletin. 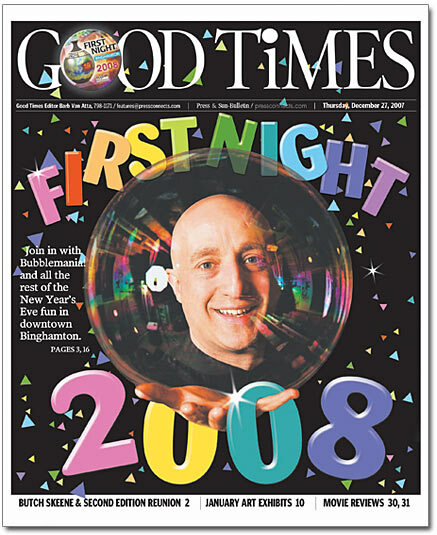 BINGHAMTON, NY - After a nearly 15 year hiatus, Casey Carle took his popular "Bubblemania!" stage show back to the region of upstate NY that includes his hometown of Greene, NY. Binghamton, NY - part of the Southern Tier Region of the state - was the "big city" to this country boy throughout his childhood and high school years. It was a thrill for Casey to look out in the audience and see past teachers, librarians, class-mates, old friends and second cousins (twice removed). Not to mention siblings, nieces and nephews. "Most if not all entertainers would admit to being nervous performing for family and friends", Carle said, "I'm happy to say they got three shows I can be proud of. I didn't fall off the stage or knock my bubble mix into the orchestra pit! It helped that they were a terrific and supportive audience from the get go. I had a lot fun playing off them. Probably because I"m one of "them" ", he adds with a smirk. For more information on Casey Carle and his ever-expanding bubble achievements visit www.BubbleMania.com.